We at COLORADO LAWNSCAPING, INC. are quite pleased that you are considering our proposal for lawn care and/or sprinkler maintenance and/or snow removal for your property. We offer full service lawn care to Residential and Commercial properties. Our Company is fully Licensed, Insured, as well as carrying Workman's Compensation. We pride ourselves on offering first class lawn care as well as unsurpassed customer service. Therefore, we offer our customers a 100% satisfaction guarantee on all services. With 21 years of experience in professional lawn care, CL, was created on the simple philosophy of offering a high quality service for a reasonable price. This is achieved through thourough training of employees, and a common focus of consistency and pride in our work. Our goal is to exceed client expectations to ensure service longevity. In conclusion, we would like to thank you for considering our prospective business proposal. 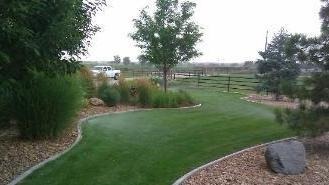 We would be happy to answer any questions that you might have in reference to our services or any other facets of COLORADO LAWNSCAPING, INC. We thank you for your time and consideration.